19th Politburo Member. As a 6th generation leader Ding has the potential for further promotion. 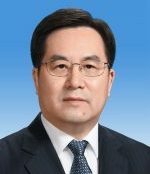 Career: Served in various roles in Shanghai, including serving under Xi Jinping and was in 2013 moved to Beijing as Deputy Director of the General Office of the CPC. Relevance to Tibet: Xi Jinping’s Chief of Staff. A 6th generation leader with potential for more senior roles in future. “Sixth generation” leaders were, in theory, due to reach the top in 2022, when the leaders who took office in 2012 have served two five-year terms. [Xi Jinping and Li Keqiang are fifth generation; Mao Zedong was first generation.] However, with Xi Jinping’s removal of the two-term limit, there is no telling when – or if – this generation will get its chance to lead. Born in the 1960s, a number of sixth generation officials have been named by China commentators in recent years as having serious leadership prospects. They include: Hu Chunhua, Zhou Qiang, Nur Bekri, Lu Hao, Chen Min’er, Zhang Qingwei and Zhang Guoqing. Names that were previously on this list but have suffered political downfall are Sun Zhengcai and Su Shilin.